Security was high at the washing line. Marianne kept a strict vigil during their visit and not one sock went missing. 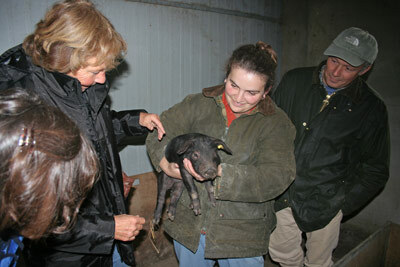 Sophie Deffis breeds noir de Bigorre pigs. They are really cute and apparently very tasty! 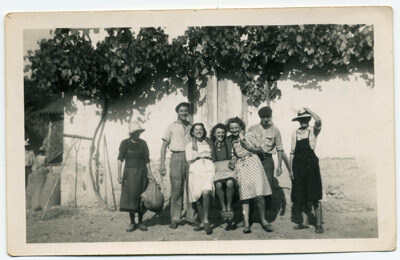 Marie-Louise, in the white dress, with neighbours during a harvest some sixty years ago. Marianne immediately set up shop in front of the porcherie. Garden chair, sunglasses, books and a pot of tea. 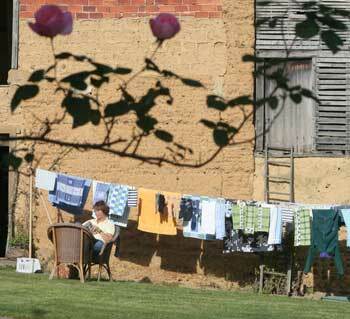 Sometimes guarding the washing line for hours on end. Such sacrifice. Mind you, there were mad moments of industry too. Like sewing the thick curtains for hanging in front of the doors, in preparation for winter (which so far hasn't arrived). Their first evening, we went to the auberge du lac in the village. It was a special evening, since Thierry, the owner, had slaughtered his pig and had prepared boudin sausage (a sort of black pudding that is served hot with apples and garlic potatoes). It was delicious, but we all kept a little room over for the isles flotantes which is the most dangerous dessert ever made. 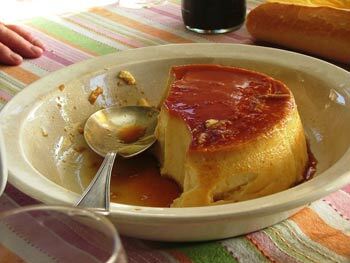 Certainly when Thierry whips up 20 of his fresh eggs, floats them on creme anglais and drips caramelised sugar over it. Oh dear, I'm drooling. A highlight of P&M's visit was a day to Toulouse. We arrived just after rush hour and went around Les Halles Victor Hugo. A large undercover market with high quality produce. 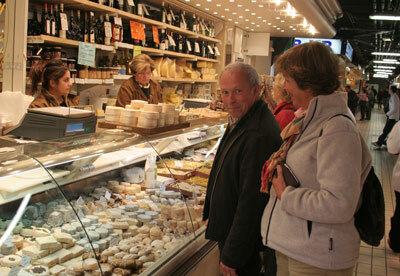 We salivated as we cruised the cheese, wine, charcuterie, fish, vegetable and patisserie stands. A quick coffee and then upstairs to the restaurants above. There are six of them, each with a speciality and all buying their produce from les halles below. We had a three course menu de jour for 16 euros, with wine included. A wander around the famed, beautiful 'pink' architecture, the chique shops and a tea on a terrace in the sun was rounded off by a quick dash through Ikea. The car was crammed with stuff for home and some frames for Perry's paintings. One of our neighbours, Sophie, breeds a rare breed of pig. The noir de Bigorre . It is like the pata negra of Spain. The pigs take much longer to fatten and the drying of the hams takes at least 18 months. This is at least twice the time taken with the pork one normally buys at the supermarket. The price per kilo is also higher. We were invited to take a tour and had waited until Peter and Marianne arrived before taking her up on her offer. We were all oohing and aahing at the cute little fellas, listening to Sophie telling us how she breeds, rears and processes. Quite an enterprise on her own. Thankfully her parents, who farm maize and barley, help out when necessary. We will order up some jambon soon...mmm. 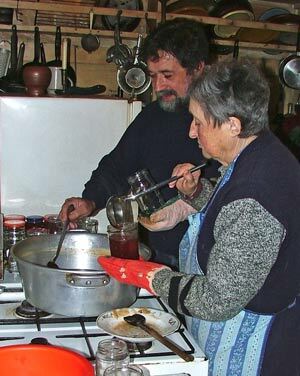 Marie-Louise, the mother of our friend Pierre, invited Caroline to come over when she was making apple jelly. Caroline loves learning the old recipes and adores Marie-Louise. I think that the feeling is mutual. Marie-Louise is almost 80, rather frail and doesn't get out much. Caroline's enthusiasm always seems to get M-L motivated, out of her chair and revealing her dry, cryptic sense of humour. The preparation involved several hours of waiting as the apples reduced in the pan. 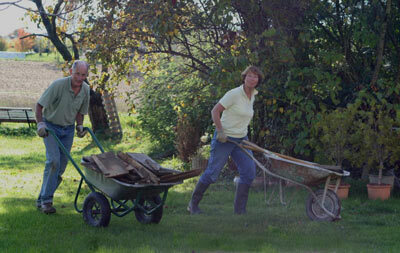 This was the time when the stories came out about M-L's youth, family and life on the farm. A box full of photos spread across the table, each telling a story. Caroline asked if she could borrow one to copy. A photo of her as a young girl. A happy face in simpler times. Oh, and the apple jelly is delicious! November was unseasonally warm. Perry played golf in short sleeves, drew and sketched on a table outside and we often ate breakfast and lunch in front of the house. For lunch on the 26th of November, at our friends, Addi and Max, we all had to sit in the shade until past 4 pm. Great food and company too.